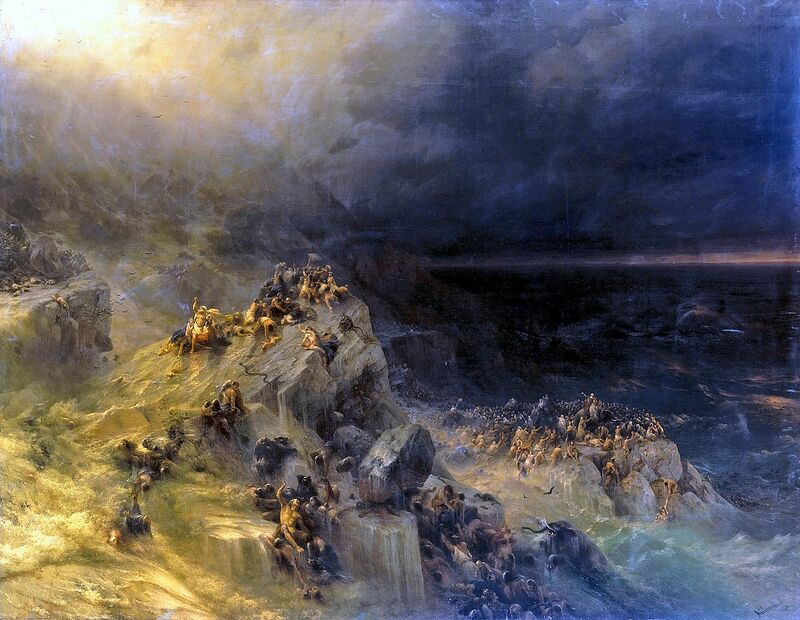 The World Deluge by Ivan Aivazovsky (1817-1900). A artist’s dramatic depiction of Noah’s Flood. Sin corrupts mankind until all hope seems lost – but not to God. Right after the Fall, He promises a Seed that will deal the deathblow to Satan. Through these ancient godless times, God preserves the ancestors of this Seed and begins to unfold His plan to rescue mankind. From Abel’s murder, through the Flood and Babel, we follow the story to the day when God calls Abraham to follow Him. Adam and Eve were now in exile outside the Garden of Eden. Satan was now “the ruler of this world” (see John 12.31, 14.30). 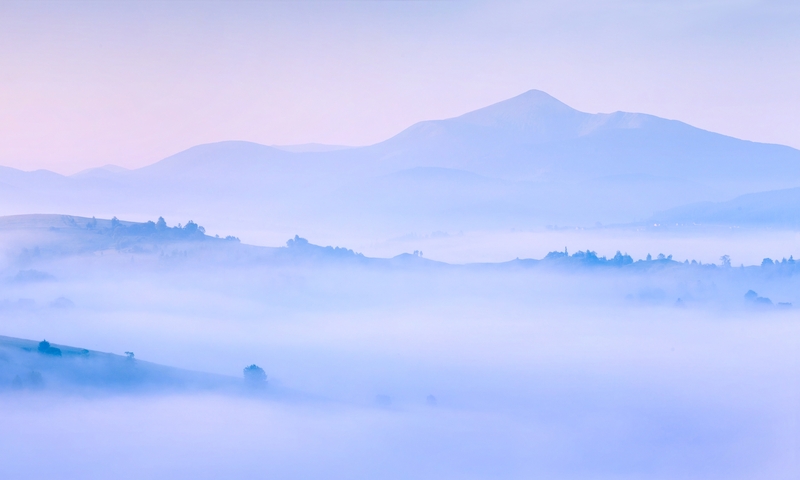 His kingdom – once confined to a heavenly realm – now had a bridgehead on earth. Remember that God called mankind to complete His ‘world project’. God commissioned us to build a cultured, godly civilisation here on Earth. We were to colonise Earth, and extend the Garden across the globe. Earth was to be a paradise, where God lived among us. Satan wants to be like God and do the things that God does. So now he began to inspire mankind to complete God’s ‘world project’. But he was to be its god. He wanted a global civilisation under his control – an ideological, political and economic empire united in rebellion against God. The tower of Babel was an early venture. Satan’s final attempt centres on a mysterious figure called ‘antichrist’ whom we’ll meet near our journey’s end. The Fall cast its deadly shadow over human history. Adam and Eve’s firstborn, Cain, killed his brother Abel. Satan, “a murderer from the beginning . . .” (John 8.44), has sown the spirit of murder into mankind’s heart. Playwright Arthur Miller commented “If a brother could murder a brother, nobody is safe . . .” God cursed Cain – the land would yield little to him. And he would now be “a fugitive and a wanderer on the earth” (Genesis 4.14). God provided Adam and Eve with another son to take Abel’s place. Eve called him Seth, saying “God has appointed for me another offspring instead of Abel . . . .” (Genesis 4.25). Seth had a son, Enosh. At that time people began “to call upon the name of the LORD” (Genesis 4.26). It seems that some people began to worship God. But Cain began to establish, in Bernard Bell’s words, “an alternative society, a godless society away from God’s presence” . He built a city. His descendants mastered the skills of animal husbandry, music and metal-working. The arts and technology, foundations of civilisation, flourished. But alongside this sophistication, there was violence. Cain’s ancestor Lamech threatened revenge on any who opposed him. Sin spiralled out of control. Evil – loathsome and depraved – flooded the Earth. The “sons of God” began to lust after human girls and marry them (Genesis 6.2). Their offspring were “the mighty men who were of old, the men of renown” (Genesis 6.4). The passage also mentions the mysterious “Nephilim” . This name likely means ‘fallen ones’. These Nephilim may be the same as the “mighty men” . Exactly what was going on is something of a mystery. The most likely scenario is that the “sons of God” were evil angels, and they were having sexual relations with human women. God’s heart is grieved. In judgment and mercy, He resolved to stem the hellish tide of sin. But faithful Noah walked with God. God confided in him. He warned him that He would destroy mankind by a flood. So He commanded him to build an enormous boat. In it, Noah and his immediate family, together with a multitude of animals, would float safely above the waters. After the flood subsides, Noah and his family, and all the animals, stepped out onto a cleansed land. God made a covenant with Noah: “. . . never again shall all flesh be cut off by the waters of the flood, and never again shall there be a flood to destroy the earth.” (Genesis 9.11). The sign of that covenant was a rainbow. But the “intention of man’s heart” was still “evil from his youth” (Genesis 8.21). We don’t return to unfallen innocence. Violence is an ugly fact of human life. God now instituted the death penalty for a murderer. Animals now lived in fear of mankind. And there’s another Fall. Like the Fall in the Garden of Eden, this fall involved fruit – here it was wine, the product of fruit. Adam’s sin caused nakedness. Noah, too, was naked. He lay exposed in his tent. “And Ham, the father of Canaan, saw the nakedness of his father and told his two brothers outside.” (Genesis 9.22). Whatever this means, it was clearly an act of perversion. One explanation is that Ham simply gazed at his naked father – a disgusting act of voyeurism that violated Noah’s dignity. Ham then dishonoured his father by proclaiming what he saw to Shem and Japheth. Noah responded in prophecy. He cursed Ham’s son, Canaan. But he blessed Shem and Japheth, who had reverently covered his nakedness and shielded him from further shame. In Genesis chapter 10, we’re given a genealogy of that ancient world. This genealogy is often called ‘The Table of Nations’. Then, in Genesis 11.1-9, we read about the city and tower of Babel. This is a flashback; it explains how the nations were divided at the time of Peleg (Genesis 10.25). From history’s dawn until many years after the Flood, mankind had one language and culture. Sometime after the Flood, people settled in a plain in the land of Shinar. They said to one another, “Come, let us build ourselves a city and a tower with its top in the heavens, and let us make a name for ourselves, lest we be dispersed over the face of the whole earth.” (Genesis 11.4). They wanted to establish a concentrated power-base – a secure, united society. And they wanted to make “a name” for themselves. But God had commanded mankind to multiply and spread across the globe (see Genesis 1.28). The Babelites were rebelling against God. It seems certain that the tower of Babel was a kind of ziggurat. These were temple towers with a shrine at the top (see the illustration below). In the Bible, mountains are often significant. For example, God gave the Law to His people on Mount Sinai. The Temple, where God lived among His people, was on a mountain – Mount Zion. It was His “holy mountain” (Joel 3.17). It seems that the inhabitants of Babel wanted a ‘holy mountain’, too. They wanted to have contact with Heaven. This explanation is supported by what we know of Babylonian ziggurats. They had stairs leading up to the shrine at the top. They were believed to be stairways from heaven to Earth, where heaven touched Earth. They were places where humanity had contact with the realm of the divine. In fact, the name ‘Babel’ in the local language Akkadian is bāb-ili, meaning ‘gate of god’. But they lived in a “a plain” (Genesis 11.2). There weren’t any mountains where they lived. So they tried to build one themselves. William Dumbrell wrote “[Babel] looked for one world, one common language family, one common social and economic platform . . . . In short, it was the beginning of the utopian humanistic dream to which mankind has always subsequently aspired.” In short, Babel is an instance of mankind attempting to create a perfect world. This was an act of arrogant self-assertion against God. Only He can bring about a perfect world. But God stepped in. He shattered mankind’s power by confusing their language and dispersing them across the globe. After the Fall, God promised that Eve’s offspring would deal the deathblow to Satan. Through these ancient times, God preserves the ancestors of this offspring and begins to unfold His plan to rescue mankind. These ancestors of are recorded in the genealogies of Genesis 5.1-32 and 11.10-26. And so, in Genesis 11.26 we encounter a man called Abram (whom God later renamed Abraham). He’s one of the key people in the Old Testament. God calls Abram out of sophisticated Ur in Mesopotamia to a land that He would show him. He promises Abram wonderful things: “I will make of you a great nation, and I will bless you and make your name great, so that you will be a blessing. I will bless those who bless you, and him who dishonours you I will curse, and in you all the families of the earth shall be blessed.” (Genesis 12.2-3). Abraham’s call launches a whole new phase in God’s plan of redemption. The Bible now leaves the arena of world history and focuses on this man and his descendants. Vaughan Roberts says: “Genesis 12:1-3 is the text the rest of the Bible expounds” . From Abram, God will bring a new humanity into being. Read Genesis 4.1-26, 5.28-9.29, 11.1-9, 11.31-12.3, Hebrews 11.4-10.
? How does the flood account link with the creation account in Genesis 1? What’s the significance of this connection?
? Sin continued after the Flood – so what did God achieve by sending the Flood?
? How does God’s covenant with Noah (Genesis 9.1-7) reflect what God said to Adam in Genesis 1.26-31? What’s the significance of this connection?
? Why did God confuse the language and disperse the people of who built Babel?
? How does Abraham’s call and blessing link to the story of the tower of Babel, and what’s the significance of this?
? How does the prophecy of Genesis 3.15 fulfilled through this period of human history from Adam to Abraham?